Which oats are healthy? The answer is, almost all of them. But you’re probably wondering which oats are healthiest. The short answer is that the least processed oats are the most healthy. But when I did the calculations for exactly how much difference the processing makes, I admit that I was surprised by the results! Oats are a whole grain that are mostly eaten by horses, at least in their unprocessed state. They get processed for us picky humans. Some oats are more processed than others, which results in the different types! The processing continuum that will help us see which oats are healthy goes like this. 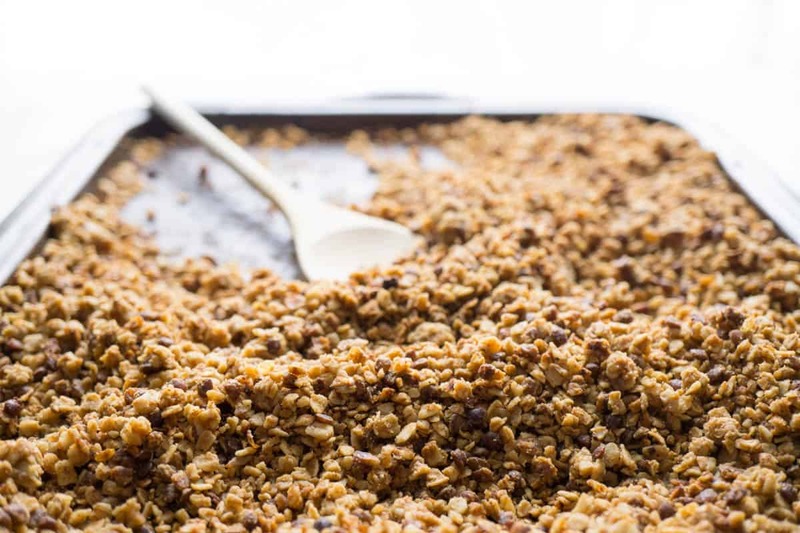 whole grain oats – horse food. You’re unlikely to find these in grocery stores. So what happens when oats are processed along this continuum from whole grain horse food to ultra processed? 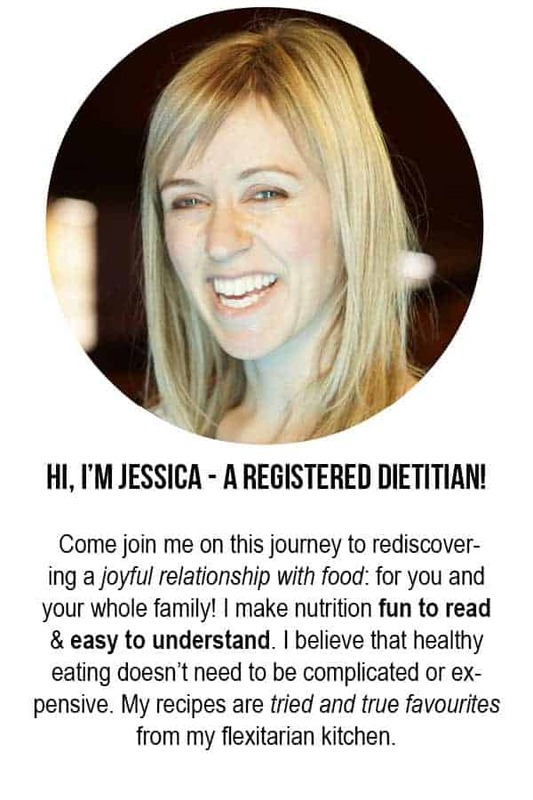 They keep roughly the same macronutrients (carbs, fat, protein), so chemically speaking they are the same, which is what the nutrition label will show. But the physical properties of the oats change, which means our bodies will digest and absorb the food differently. When you eat oats, your body releases enzymes to break them down into simple sugars. Your body then absorbs these sugars into the bloodstream. This breakdown of starches can happen fast or slow, depending on various factors. It’s easier for your body to handle sugars at a slow, steady rate. The glycemic index tells us how fast the food breaks down into sugar. A lower number means that the food takes longer to breakdown and enter the blood, which is good! A higher number means that this food can cause a blood sugar spike, which is… not good. 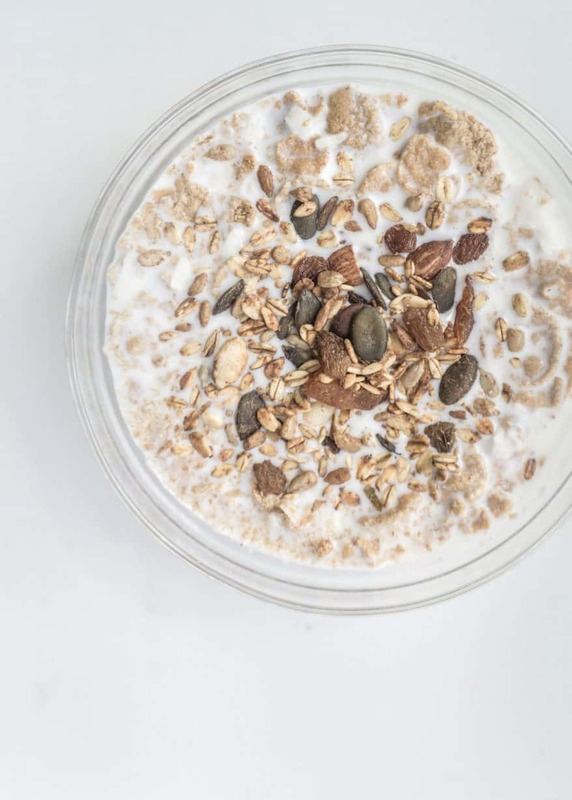 The glycemic index is the most important factor that will tell us which oats are healthiest. Anything under 55 is considered low. Anything over 71 is high. When I finally sat down to look at the numbers, I figured I already knew the answer about which oats are healthy. I was expecting there to be a marked difference between the steel cut oats, the old-fashioned, and the quick cooking. I thought the more processed oats would have a much higher glycemic index. 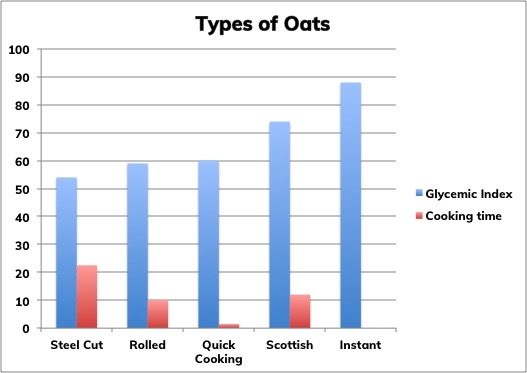 But the numbers show that the difference is actually fairly small, at least between steel cut oats and quick cooking oats. … you really are not making much of a concession in choosing them! Instant packets, on the other hand, I would generally avoid. If you want something quick in the morning, or something to keep at work to make easily with hot water from a kettle, try these homemade instant packs! They’re low in sugar and salt, but high in flavour! So, if you’ve been snooting your nose up with your steel cut oats, you don’t really have much to brag about. If you enjoy them, go ahead! I recently tried them for the first time and I was pleasantly surprised! I really, really enjoyed the texture! They retain some of their chewiness, even after cooking, and this was a delight to my senses! 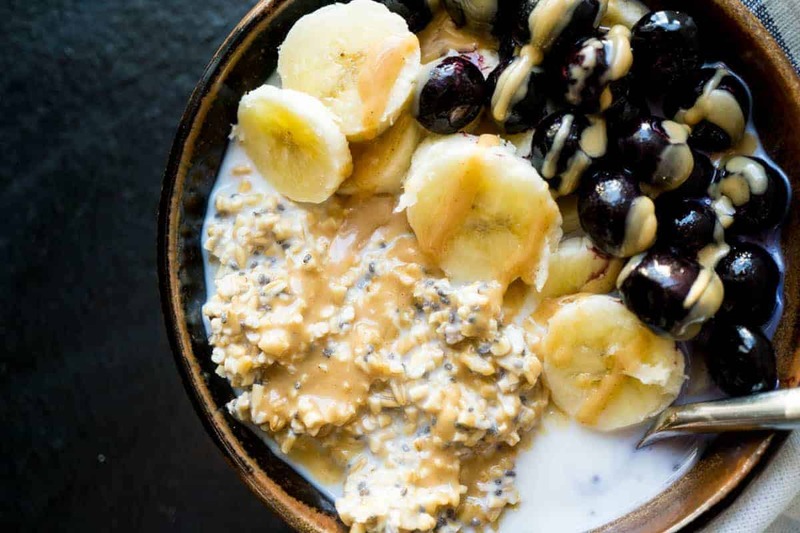 Check out this guide for cooking them in the Instant Pot (takes about 20-25 minutes total time) and this recipe for easy overnight steel cut oats! Which types of oats are YOUR favourite? After reading this article do you think you’ll stick with them or switch? Hit me up in the comments with your answers! p.s. here are some other articles that may interest you…. which milk or vegan alternative is best for you and your family? is powdered peanut butter a good choice? Thanks for breaking this down. This makes for less guilt when not spending an hour cooking steelcut! No doubt! Ain’t nobody got time for that! The creator informed us store bought wheat is poison. Apparently, it’s prumarily stale. Fallen angels are up to millions of years old, they eat humans they can weaken, subdue. They are magicians compared to humans. It is not our place to assume we know better. And they spearhead poison processed foods. Yahweh informed us most humans which wound up Satan’s food have been the low fat low calorie vegetarians crowd. insane, loony joke if I ate only veggies. I can’t function if I don’t eat. The humans body is a furnace. These fallen bodies are not what Adam had in garden Eden. They need meat. Humans will die in 2 weeks when not fed fat. Google rabbit disease. Rabbits have no fat. People used to die eating only rabbit in winter. Vegetables given to interrogation mind control torture victims = Makes you looney, weakens mind. A study was done with rats. The rats would not touch processed wheat. IF GIVEN A CHOICE. It was determined wheat gets stale. If force fed only bread, the rats developed all our modern ills, became violent, formed gangs, became extinct. Rats fed cereal died before those that were starved. ground fresh. Lucifer will enforce Mark of the beast soon, and humans with stored wheat can survive it. So, that is why Satan’s people are online teaching that wheat is a poison. When oats are smashed, the seed is killed. Lastly, my experience there is a starkly noticeable difference. When I eat fresh ground wheat, blood sugar doesn’t spike. & I can bicycle with noticeably greater stamina. I found this article after searching on the best types of oats to buy and it’s really helpful. I’m a type 2 diabetic who keeps their sugars really well controlled. I try to stay clear of carbs that will spike my sugars so oatmeal in the best forms is ideal. I really love chopping up an apple (skin and all) in a large pot of oatmeal with some cinnamon; the results are fantastic. I’ve tried to stick with steel cut but really love the chewiness of very rough, thickly cut rolled oats. It makes me feel so much better over my choices seeing the information you provided so thank you. I’m so happy the post helped you! Best wishes.